Guitar case Alhambra 950 with hygrometer, for classical and flamenco guitar. This special guitar case is made from polyurethane to make it super strong yet very light to carry. The interior is luxury fitted with soft cloth and has plenty of room for accessories. The exterior has a luxury leather like finish. 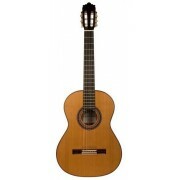 Fits any standard 4/4 classical, electro classical or flamenco guitar. The built-in hygrometer provides constant information about the humidity level inside the case. 3.8 Kg.